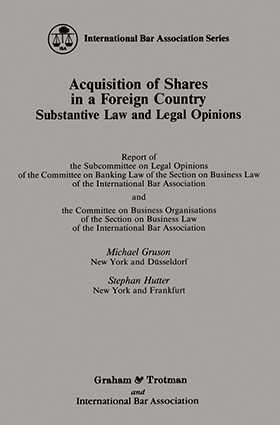 This new book contains a detailed analysis of the legal requirements in connection with the issuance and transfer of shares in a foreign country. The book discusses issues such as the mechanics of transfer, foreign stock ownership, registration and notification requirements, good faith acquisition of shares, transfer restrictions and lost or stolen shares under the laws of twenty-eight different countries. In addition, the book proposes - for each jurisdiction model - legal opinion language (and appropriate legal opinion backup) which counsel to the purchaser should request in order to protect his client. The book is a valuable tool for anyone who purchases a company or a stake in a company in a foreign country. Reports from the following countries are included: Argentina, Australia, Austria, Belgium, Brazil, Canada, Czechoslovakia, Denmark, Finland, France, Germany, Greece, Ireland, Italy, Japan, Luxembourg, Mexico, Netherlands, Portugal, S. Africa, Spain, Switzerland, UK, Hong Kong, Scotland, U.S.A., Venezuela. 1. Introduction. 2. Authorization and Issuance. 2.1 General. 2.2 Original Issuance. 2.3 Capital Increase. 2.4 'Authorized' Capital. 2.5 Documentary Investigation. 3. Transfer of Shares. 3.1 General: Liability. 3.2 Bearer Shares. 3.3 Registered Shares. 3.4 Form Requirements. 4. Adverse Claims. 4.1 General. 4.2 . Restrictions on Transfer. 4.3 Bona Fide Purchases. 4.4. Liens; Encumbrances. 5. Governmental and Third Party Approvals. 6. Foreign Stock Ownership. 7. Lost or Stolen Shares; Voidability. 8. Model Opinion Language. 8.1 . Orginal Issuance. 8.2 Secondary Sales. 8.3 . Qualifications. 8.4 . Comments.